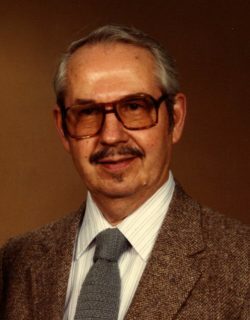 Luther Leroy Shetler died on December 15, 2018. He was born on July 1, 1917 on a dairy farm near Goshen, Indiana, to Alvin P and Sadie (Yoder) Shetler. He graduated from Goshen College in 1938 and married Geneva Stamm in Goshen on December 22, 1940. 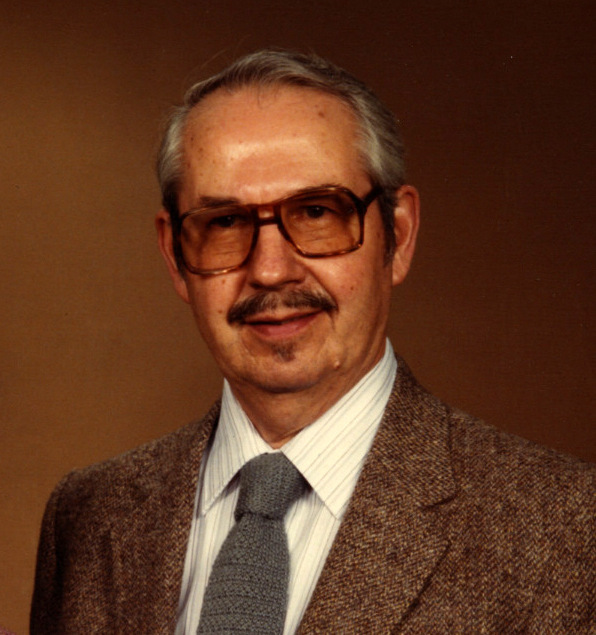 He received a doctorate in Mathematics Education from Indiana University and came to teach Mathematics at Bluffton College in 1950. He was a quirky, inventive and endlessly curious teacher and loved by his many students. Luther shared with his students and family a sense of wonderment of seeing math everywhere in nature and in art — often selecting vegetables at the store that illustrated symmetry or the Fibonacci series and he loved all kinds of puzzles. He and Geneva often sponsored international students and extended hospitality to them during the holidays. He retired from Bluffton College in 1984 and began 25 years of volunteering at Bluffton Hospital and Mennonite Memorial Home. During retirement he and Geneva enjoyed traveling and learning at elderhostels in the US, Central America and Europe. He was well known in NW Ohio and Indiana as ‘The Bubble Man” for his lectures to churches and school groups linking Mathematics and Nature – usually ending by an audience member being enclosed in a bubble — if the bubbles were working that day. In 1959 he and friends started building their unusual ‘house in the woods’ designed by a college friend. His grandfather Shetler was a skilled woodworker and furniture builder and Luther enjoyed woodworking – and acquiring the right tools for the job! In addition to their house, he built mathematical models, his desk, classroom furniture for his wife and teacher daughters and many gifts. He enjoyed working with his hands, whether in the yard or fixing things in the house. Luther had a great sense of humor and loved to laugh! Everyone who knew him will remember the many times we were all bent over with laughter barely able to breathe. He also loved visiting and eating with friends and he and Geneva often hosted a house full of guests sharing stories and laughter. Their home was a family gathering place with regular Thursday tea-parties for all comers and they met with a “lunch bunch” of good friends for many, many years. Luther was known and loved by friends all over town, at Maple Crest and the Mennonite Memorial Home for his stories and good cheer. Luther was a member of Bluffton First Mennonite Church. He cared deeply about justice and alleviating oppression and suffering in the world. He read widely, kept up his interest in politics and volunteered as a poll worker for many years. He is survived by his wife of 78 years, 5 children: Joenita (Stanley) Clemens, Bluffton, Terry (Bonnie Wolfe) Shetler, Bellvue, CO, Lu Derstine, Bluffton, Peter (Jan Bender) Shetler, Goshen, IN, and Tami (Michael) Hardy, Bluffton. He has 14 grandchildren and 31 great grandchildren. He is also survived by 2 nieces: Dorcas (Spencer) Haddock and Darla Schrock; and 2 nephews: Lincoln (Kathy) Schrock and Arlen (Eileen Murphy) Schrock. He was preceded in death by his parents, Son-in-law Dale Derstine, his sister Lura (Titus) Schrock and his nephew Laurel Schrock.